Hey, guys! are you plan to start your own cosmetic store? I have not to say Cosmetic service is very popular all around the world. it mainly located in a shopping center or cosmetic store. mainly for display skin care product, cosmetic, or makeup service. In this article what I wanna share is an Elegance white cosmetic shop with display fixtures design for sale. if you’re interested to start your own store, it’s necessary to see more details below. Size: 40sqm or according to your store. Used: shopping center or cosmetic store. You can see the whole cosmetic shop mainly tone is white, match a little black, it’s very modern and elegant. at the front part is a big entrance door, is a big logo showing. the left and the right side is some high wall display shelves, mainly for display skin care product. the top part install spotlight, each plate is hidden led light strip. the bottom is some cabinet for storage. 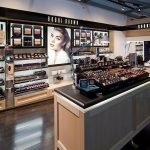 In the middle of this store is a cosmetic display stand, at the top black part is some sculpture plate, it’s very nice to fit the nail polish bottle, lipstick and more. At the back sides is a long wall display for nail polish. here are some round shape nail polish display stand and a makeup table, Can accommodate up to four guests at a time. the next to is a small cashier counter with images wall. the front surface with some waved plate for decoration, looks very nice and high-end. You will notice the whole store selling and the floor is white. the furniture and decor go well together. each counter bottom hidden white led light strip, it makes the whole store looks very tidy and attractive. Thanks for your time and reading. hope this article is helpful to your business. 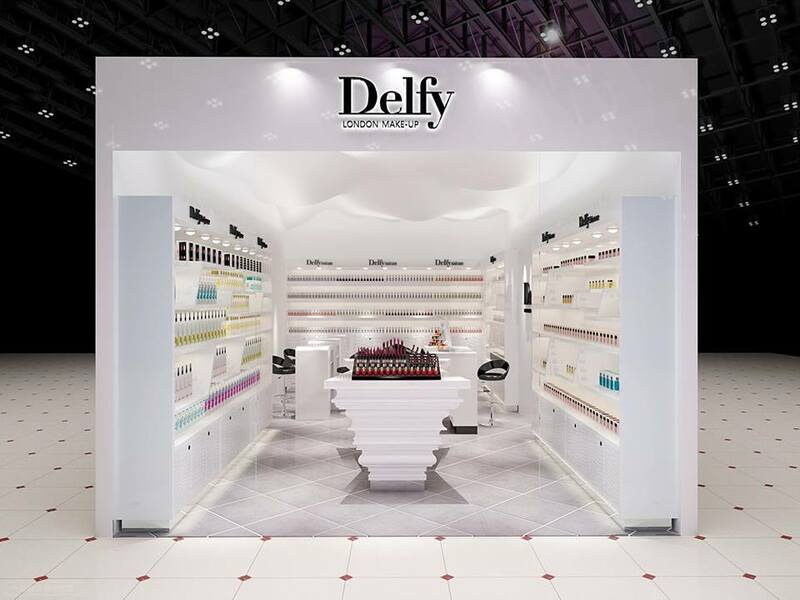 if you’re interested to start your own cosmetic store business, for further information or related design, please direct contact us, welcome inquiry!